This article covers some basics about modern firearms – stuff available from the 1930s onward. As always with Weapons Locker articles, we are interested in *fiction*, with an emphasis on comic books – but also on action movies and video games, since those media do the heavy lifting in shaping perception of firearms. Though the lead writer does happen to have military training, we’re not here to discuss real-world firearms and their use. Furthermore, it is centred on American fiction, since this is the one that floods the world over – and feeds on conventions developed elsewhere, such as Hong Kong action movies of the 1990s. This article is dual-statted for both DC Heroes 3rd Edition and Mutants & Masterminds 3rd edition. Neither of these systems is oriented toward fine-grained distinctions, and a set of stats can easily cover an entire category of weapons. We’re not going to draw any distinctions between, say a 9x19mm and .40S&W round, because the game systems simply do not support it. People interested in finer distinctions are better-served by more details-oriented games (my favourite is GURPS 4th edition). This also means that this article isn’t about long lists of guns – they’d all have the same stats ! The illustrations in this article mostly come from the Internet Movies Firearms Database , and we own the copyrights to absolutely none of it. If you like the photos, hit the IMFBD, there are many more and they’re larger. As noted above, and as heavily emphasised through the article, this text is about firearms as depicted in comics books, action movies and video games plus some related genres like pulp novels. This is all about fictional things. It’s not meant to cover anything like real world weapons, which behave differently, and makes no claim whatsoever about realism. The article does provide some useful facts and figure about how these things work, but this is all intended for verisimilitude, not realism. When the common depiction fiction is very different from the real world we’ll mention it, but the goal is not explain how it works in real life. The tone and content of the article are probably clear enough that this disclaimer isn’t necessary, but many people have a rigid stance on the subject. Better safe than sorry, heh ? In this article “Heavier weapons”, they are understood as things that can still be vaguely be considered man-portable – by action fiction standards. It used to also cover grenades, but these now live in their own article. Many firearms reference special rules — for instance Long Reload or Autofire in DCH, or Armour-Piercing or Shotgun Blast in DCA. See the corresponding New Rules Files for each game system. A large gun that can fire long bursts of rifle ammunition. It usually has a longer and heavier barrel than a rifle, and a feeding mechanism that accepts long belts of ammunition for continuous automatic fire. Light machineguns (LMG) usually come with a bipod so they can be operated prone. The machinegunner normally has an assistant who carries more ammunition and keeps the machinegun fed. Ever since World War II, the LMG is the lynchpin of the infantry fireteam – a squad without one loses about half its firepower. Since the 1980s, marked by Rambo movies starring Sylvester Stallone, US fiction had a tendency to depict hugely muscled men operating such weapons all by themselves, firing from the hip and mowing down their foes. Firing LMGs from the hip is quite possible (though it’s going to be suppressive fire, not aimed fire). And real-world LMGs do trend toward lighter, more compact weapons in smaller calibres that can indeed be operated by one man in an efficient fashion – even if he’s not a bare-chested body-building champion. See “Squad Automatic Weapon” below. DCH LMG [BODY 04, Projectile weapons: 07, Ammo: 06, R#03, Recommended STR 03 (none when using a bipod and the Bracing Bonus), Advantage: Autofire, Drawback: Long Reload, MPR (heavy and cumbersome – cutting movement speed by 1 – unless your STR is 2 APs above the Rec. STR]. LMGs are generally belt-fed, so it is possible to increase the Ammo score by increments of 6 as long as additional belts of ammunition can be carried – and attached to the belt(s) being fed in time. M&M LMG [Ranged Multiattack Ballistic Damage 6, Takedown 1, Quirk 2 (requires STR 1 to use without a bipod, heavy and cumbersome (cutting movement speed by 1) unless your STR is 4+)]. 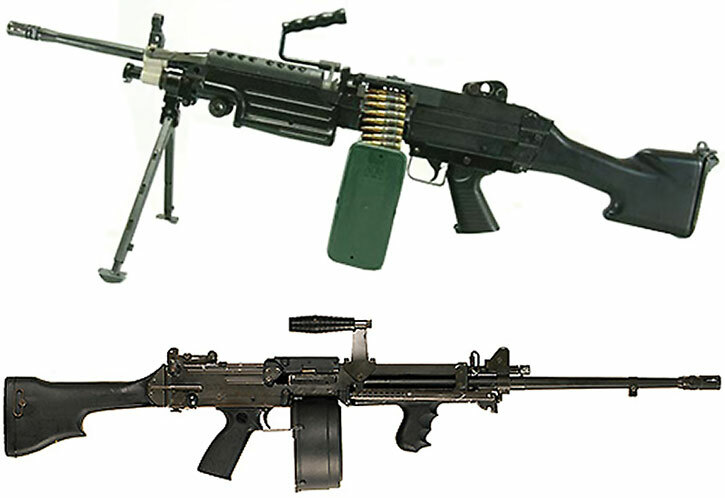 The archetypal weapon in this category is the M60 LMG, whose visuals are closely associated with the Việt Nam war and the aforementioned Rambo movies. The iconic model illustrated here is from the 1970s. More recent models are more compact. The second example is *the* light machinegun of the XXth century. This is the extraordinary MG42 used by the Third Reich, upon which a lot of modern weapon design is based (including the M60). A trend in automatic firepower is toward light machineguns that are easier to handle and fire a lighter bullet (5.56mm, like assault rifles). Such lighter weapons, able to carry more ammunition, are of particular interest to paratroopers and in countries where soldiers are on average smaller than Western European and American soldiers. From there they spread on. The best-selling Squad Automatic Weapon is now a familiar figures in most militaries, including the American branches of services. Squad automatic weapons, despite firing a lighter round, have all the features of a larger LMG. For instance the barrel can usually be removed when shooting for a long while – to be replaced by a fresh barrel while the first barrel cools off. DCH SAW [BODY 04, Projectile weapons: 07, Range: 06, Ammo: 12, R#03, Recommended STR 02 (none when using a bipod and the Bracing Bonus), Limitation: Projectile weapons has No Range and uses the listed Range instead, Advantage: Autofire, Drawback: Long Reload, MPR (heavy and cumbersome – cutting movement speed by 1 – unless your STR is 1 APs above the Rec. STR]. Ammo assumes a 200 rounds belt container. M&M SAW [Ranged Multiattack Ballistic Damage 5, Takedown 1, Quirk 1 (heavy and cumbersome (cutting movement speed by 1) unless your STR is 1+)]. The best-selling, category-defining weapon is the FN Minimi, best-known in the US as the M249 Squad Automatic Weapon. It was noticed in action fiction when De Niro had one in Ronin , but nowadays they routinely appear in games and films depicting the modern US military. The vast majority of SAWs are going to be the good old Minimi. 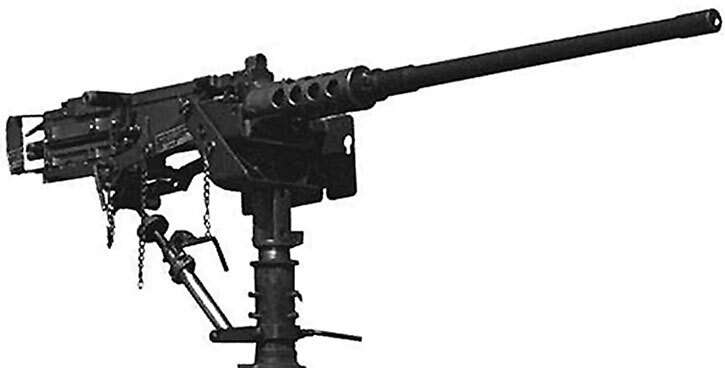 For variety’s sake, we’ll also provide an example of an early “very light machinegun” – the Ultimax 100 from Singapore. The Browning Automatic Rifle, universally called the Bar, loosely fits in this category. It has the stats above, but in DCH the Ammo is 04. This weapon arrived too late for World War One, but was very popular during the 1920s and 1930s as a sort of heavy assault rifle. Bonnie and Clyde used Bars, as did famous lawmen and criminals of the Roaring Twenties before them. Clyde sawed off the barrel and stock of some of his Bars. American infantry during World War Two was big on those, often trying to scrounge up additional Bars to increase the fireteam’s firepower. The prop weapon seen in the 1987 movie Predator impressed an entire generation of action movie enthusiasts. It gave rise to an entire weapon category that is often encountered in comic books and video games, particularly for troops that are meant to be somewhat futuristic. In some stories and games, *all* machineguns have multiple rotating barrels to signify a high rate of fire. In games the main early example was the chaingun in DooM (1993), though players may notice that it fires the same round as the basic pistol. See our DooM-specific Weapons Locker article. Carrying enough ammo is impossible without a vehicle. Rotating barrel arrays do not work as commonly depicted (they don’t need a warm-up time, only the barrel aligned with the chamber actually fires, etc.). There’s the matter of maintenance and lugging around an electric battery (the Predator prop gun was actually fed using a cable hidden in the background). The weapon with about twenty seconds of ammo would weight 150+ pounds. Real-world machineguns with rotating barrels (such the M134 Minigun, whose name is often used as a shorthand for the whole category) are normally used from speeding aircrafts who have a short time to strafe a zone. They need to deliver a high volume of fire over but a few seconds, especially since they are often unable to see what they’re firing at due to foliage and other concealment. As to the multiple barrels, they are a workaround. The goal is to handle the problems with machinegun barrels heating up when a bunch of rounds pass through them. 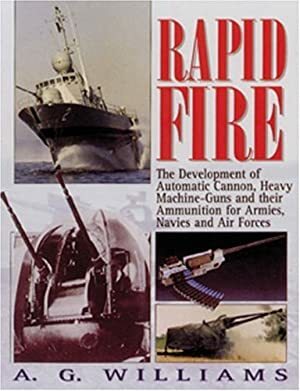 This approach was used many decades before with the old Gatling machinegun (the barrels rotated as the operator… turned a crank), and miniguns are thus sometimes called gatling guns. DCH MP Minigun [BODY 04, Projectile weapons (Area of Effect 1 AP): 08, Ammo: 10, R#04, Recommended STR 04, Advantage: Autofire, Drawbacks: Very Long Reload, MPR (heavy and cumbersome – cutting movement speed by 1 – unless your STR is 2+ APs above Rec. STR)]. M&M MP Minigun [Array : either Line-area 4 Ballistic Damage 7, Takedown 2 — or Cone-area 3 Ballistic Damage 6, Takedown 2. Quirk 2 (requires STR 2+ to use), Quirk 2 (heavy and cumbersome – cutting movement speed by 1 – unless your STR is 5+]. 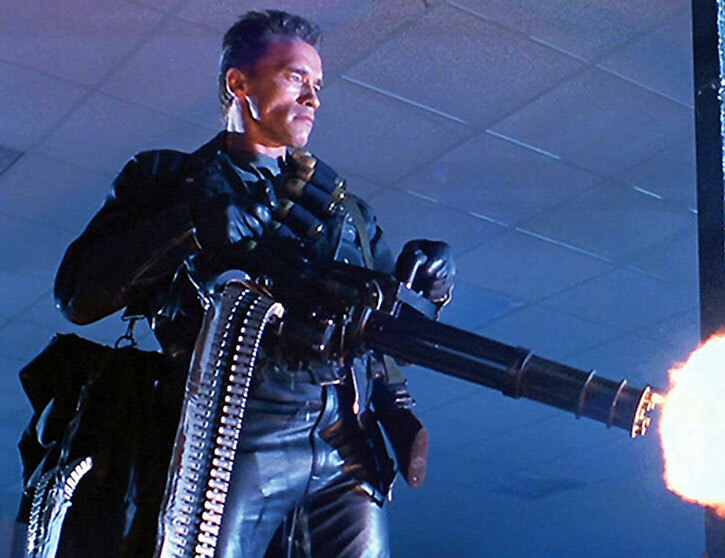 The gun pictured below is the prop M134 used in Terminator II . It uses a different configuration than in Predator as Hollywood armourers made it look cooler, with a new chainsaw-style front handle. Miniguns in video games are usually based on this prop, which has since showed up in other action movies. While unrealistic, man-portable miniguns are now expected of near-future militaries in games, comics and movies. The man-portable minigun craze that started more than 20 years ago eventually resulted in mere mooks toting one. This was originally a comic book thing. Every person with a machinegun in a book drawn by Jim Lee since 1992 has one. But it eventually became a movie thing when enough prop miniguns became available in Hollywood armouries. For instance, a random NEST trooper is thus armed in one of the Transformers , mmm, products. These guns do not appear to perform much better than your standard squad automatic weapon. But they put out more volume and are good at eliminating other mook-type opponents. They don’t have the stupendous power that is associated with more heroic miniguns, being largely visual effects. To tell them apart from the real thing we’ve nicknamed those “Young Painless”. This is a small joke about the Predator minigun, which was nicknamed “Old Painless” on the movie set. DCH Young Painless [BODY 03, Projectile weapons (Area of Effect 1 AP): 07, Ammo: 08, R#04, Recommended STR 03, Advantage: Autofire, Drawbacks: Very Long Reload, MPR (heavy and cumbersome – cutting movement speed by 1 – unless your STR is 2+ APs above Rec. STR)]. M&M Young Painless [Array : either Line-area 4 Ballistic Damage 6, Takedown 2 — or Cone-area 3 Ballistic Damage 5, Takedown 2. Quirk 1 (requires a STR of 1+ to use), and Quirk 2 (heavy and cumbersome – cutting movement speed by 1 – unless your STR is 4+]. 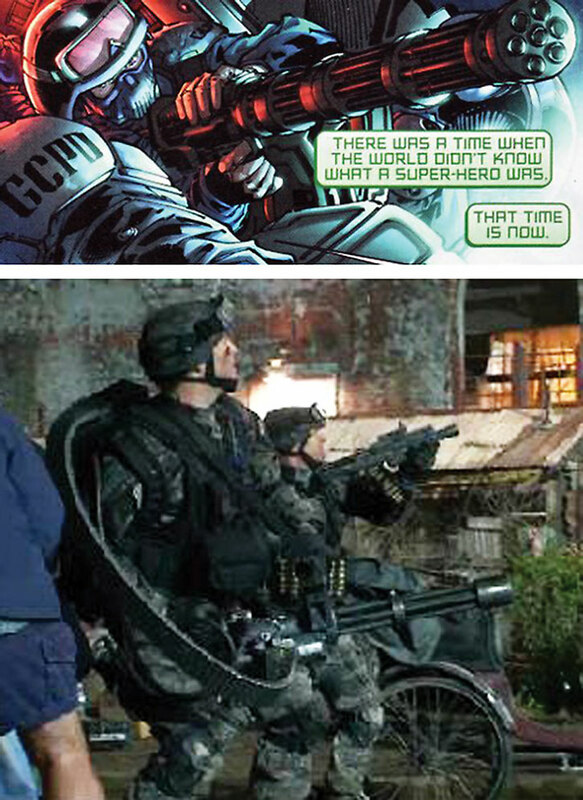 Below are a recent Jim Lee Young Painless (from the JLA 2011 reboot) and a shot from Transformers – Return of the Fallen. These weapons derive from the WWII Panzerfaust concept. It is a one-shot rocket launcher fired from the shoulder to hit a vehicle (up to and including tanks), a bunker or even (with lots of luck) an helicopter. One such Soviet weapon, the RPG-7 (rocket-propelled grenade model 7) was a huge success. It has become a symbol of asymmetrical warfare – highly mobile irregular troops with small arms who can attack forces that are using much heavier and expensive equipment. There was something of a race between modern tanks and disposable infantry rocket launchers. Launchers did not win, but still remain useful. Even if the warhead has little hope of penetrating the front armour of a modern main battle tank, it is still possible to achieve a mobility kill by crippling a tread. A tank that can no longer be driven around is much less problematic in movement warfare. And lighter armoured vehicles such as Armoured Personnel Carriers remain vulnerable to these rockets. In fiction, this type of launcher is usually portrayed as accurate enough to hit people with, particularly when employed against bulletproof superhumans such as Luke Cage. You can shoot people with a rocket launcher as easily as you can with a semi-automatic rifle. This is true even outside of comics. Chuck Norris movie Invasion USA featured a close-range duel between two men with disposable rocket launchers. In the real world, rocket launchers and enclosed spaces do not go well together. There’s a lot of burning gas from the backblast, a strong shockwave and a huge sound blast. In fiction, however, firing rocket launchers indoors, from helicopters, etc. is common so this issue can be completely ignored. Some real-world models of launchers can be fired indoors. They usually use a piston that shoots the rocket out of the tube – the rocket then fires up its jet engine, but it’s already far enough away for that to be safe. Such launchers often eject a bunch of plastic flakes as the piston’s reaction mass. DCH RPG [BODY 01, Bomb: 04, Projectile Weapons: 09, Sharpness (Projectile weapons): 02, Ammo: 01, Bonus: Projectile weapons and Bomb can be Combined (Bomb rides the Range of Projectile weapons)]. M&M RPG [Ranged Damage 9, Burst Area Ranged 6, Takedown 1, Armour-Piercing 2, Limited 2 (One-shot)]. 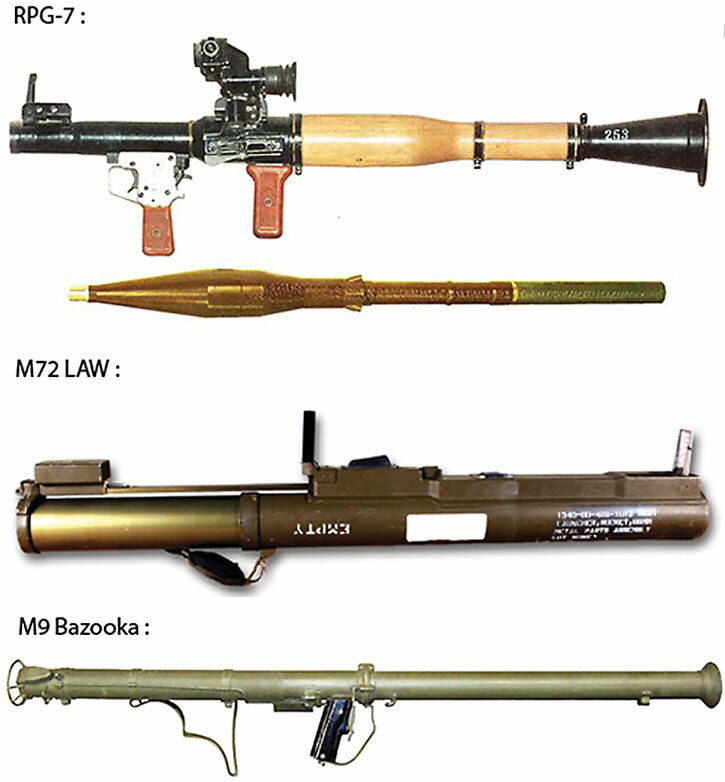 The first model illustrated is the RPG-7 from the 1960s (more modern models no longer look like that), then its American equivalent the M72 LAW (Light Antitank Weapon) and finally the WWII-era M9 “Bazooka” launcher, often featured in comic books from the 1950s to the late 1970s. 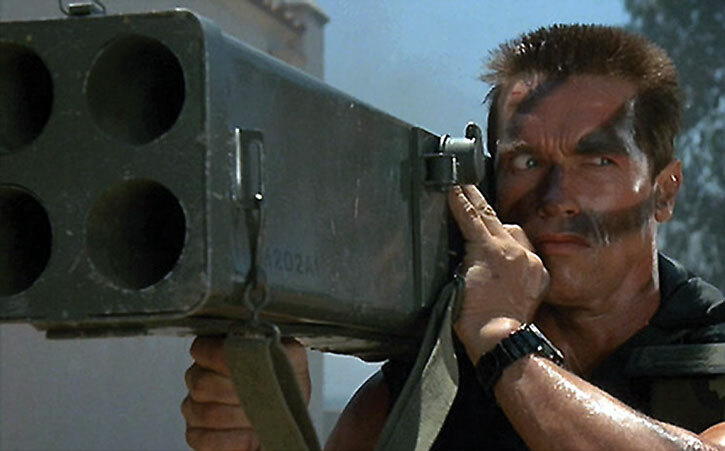 Commando — the ultimate 1980s action movie, encompassing and transcending its own parody — featured a four-tubes man-portable rocket launcher. This was a M202 FLASH, a weapon that normally launches incendiary rockets and is mostly intended to attack bunkers. But in the movie it was depicted as launching explosive rockets. Given how popular that movie was with Generation X action movie fans, portraying four-tubes launcher (Ammo: 04 in DCH, drop the Limited 2 in DCA) in action stories should not pose problems. Originally, disposable infantry rocket launchers were intended for use against armoured vehicles – and, in a pinch, fortifications. But eventually came weapons that look similar, yet fill a different role. The main real-world example are the RPO Russian launchers. These fire larger (93mm) rockets. The available warheads aren’t intended to punch through armour, but to blow stuff up. Their tactical role is thus somewhere between demolitions, a long-range flamethrower, and man-portable one-shot short-range field artillery. RPOs were first seen during the 1990s, then gradually made their way to parties who like buying Russian weapons. They have little presence in fiction that I know, but are the sort of weapons that get used in tabletop RPGs. Probably to kill a horde of mutant psionic undead alien armadillos. Thermobaric (a.k.a. fuel-air explosive). These barbaric (except when *we* use them, of course) warheads first explosively disperse a cloud of special fuel over a large area, then set it on fire. Since that burns the very oxgen in the air, an even larger implosion follows the explosion. So long pressure wave, huge cloud of fire everywhere, sudden pressure drop that wrecks lungs and eardrums, then long pressure wave in the opposite direction to replace the piece of atmosphere that just burned off. And the fuel is usually toxic. Thermobaric [Pyrotechnics (Diminishing Area of Effect 3 APs): 06 Combined with Mental blast (Diminishing Area of Effect 3 APs): 06, R#03]. Incendiary [Flame project (Diminishing Area of Effect 2 APs): 09, R#02]. Flamethrowers were used back when static defences such as trenches, fortified tanks, machinegun nests and bunkers were a major issue. Getting close to these hardpoints and splashing them with burning fuel was a pretty good idea since infantry couldn’t otherwise carry enough firepower to deal with those (grenades can seldom be thrown with enough precision in real life). Shoulder-fired rocket launchers started replacing flamethrowers in some such roles. Furthermore, precision airstrikes and artillery fire made static defences increasingly untenable. Smart grenade launchers might be the solution that fully replaces flamethrowers, which have not been in general use for decades now. A flamethrower is usually a pair of steel tanks carried on a backpack-like infrastructure and filled with thickened fuel. It is released at a high pressure through a sprayer, which also ignites the fuel as it is spurted out of the barrel. With a arcing spray it is sometimes possible to splash things at 25-30m, but 20 metres is a more common range. Fuel gets spent quickly. Even with excellent trigger control and quick spurts there’s maybe 6 to 10 seconds of fuel in a typical flamethrower. DCH Flamethrower [BODY 03, Flame project: 07, Ammo: 06, Range: 03, Rec. STR 01, Advantage: Autofire, Bonus: Flame Project does Continuing Damage (like Disintegration) for up to 5 Phases, Limitation: Flame project has No Range, use the listed Range, Drawback: MPR (heavy and cumbersome – cutting movement speed by 1 – unless your STR is 2+ APs above Rec. STR)]. M&M Flamethrower [Cone-Area Flame damage 6, Secondary Effect 4, Quirk 1 (heavy and cumbersome – cutting movement speed by 1 – unless your STR is 1+)]. In fiction, it is almost inevitable that somebody’s flamethrower will get hit and explode in a huge fireball. This is an unrealistic, but well-entrenched trope. Flamethrowers can thus be targeted with a Trick Shot (in DCH) or with a -5 attack penalty (DCA). They are usually hit by random fire, though (a double that hits its target in DCH, a Critical in DCA). If the attack has any incendiary property (even a bullet will do, somehow) and damages the flamethrower, then boom (Bomb: 10 in DCH, Burst-Area 2 Flame Damage 9 in DCA). 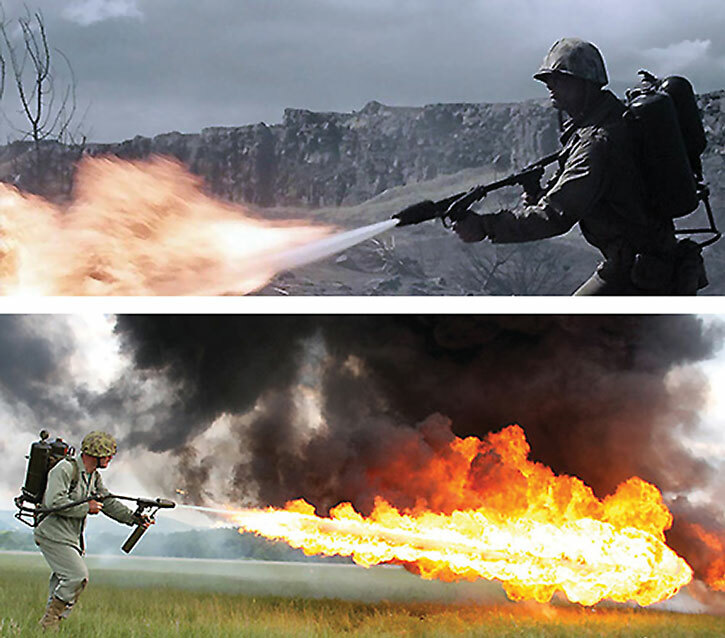 The typical WWII American flamethrower is the M2 and its variants. The smaller steel tank riding the two fuel tanks is the nitrogen used to propel the fuel, and the whole weighs about 30 kilograms. It probably remains what most people in the West think about when it comes to flamethrowers. Like many other weapon systems, anti-tank rifles (ATR) only made sense during an era of technological change. Roughly speaking, from the second half of World War One to the first half of World War Two. Before this era there were practically no tanks. After this era tanks had become too tough for a rifle-type weapon to damage. Infantry anti-tank firepower evolved along the lines of the Panzerfaust and its successors, as mentioned in the Disposable Infantry Rocket Launcher entry. The earlier models were loosely comparable to high-powered sniper rifle. Eventually they resembled primitive anti-materiel rifles (such as the .55 Boys ATR), albeit with less impressive ballistics than modern weapons. The last weapons in this category were essentially light cannons, and it would be a stretch to call them “man-portable”. However, in fiction there certainly are men, women and others who can tote and fire a 7’ long, 55Kg cannon – and it can look good on a vehicular mount. There are also… niches, such as having to engage the larger dinosaurs, giants, alien power armour, practically indestructible zombies amalgamating the corpse of 20 people and pulsing with unholy radiation, superhumans, etc. Similar weapons are used by Seras Victoria in Hellsing, thanks to her superhuman physical power as a vampire. DCH 20mm ATR [BODY 04, Projectile Weapons: 09, Ammo: 10, Rec. STR 05 (00 when positioned and mounted), Drawback: MPR (heavy and cumbersome – cutting movement speed by 1 – unless your STR is 2+ APs above Rec. STR), Long Reload]. M&M 20mm ATR [Ranged Damage 8, Quirk 1 (requires a Strength of 04 or more to carry and use by oneself), Quirk 1 (heavy and cumbersome – cutting movement speed by 1 – unless your STR is 6+)]. Our exemplar here will be the Solothurn S-18/100, made by a Swiss firm bought by a German company to dodge post-WWI arms regulations. As can be plainly seen, you’re meant to use it from a prone position, and you probably brought it there with 2 or 3 of your best friends, who are now wondering whether they want to remain your friends. An alternative is to use a special two-wheeled carriage. Or to break it down into two parts that can more or less be carried by infantrymen (the larger of the two parts is 33Kg). Modern weapons exist in this category, though of course they are not meant as “anti-tank” weaponry. 20mm precision weaponry is closer to being a very heavy anti-materiel rifle. DCH Modern 20mm ATR [BODY 03, Projectile Weapons: 09, Ammo: 03, Telescopic vision: 013 Rec. STR 05 (00 when positioned and mounted), Drawback: MPR (heavy and cumbersome – cutting movement speed by 1 – unless your STR is 1+ APs above Rec. STR), Long Reload]. M&M Modern 20mm ATR [Ranged Damage 8, Senses 1 (Extended visual), Quirk 1(requires a Strength of 04 or more to carry and use by oneself), Quirk 1 (heavy and cumbersome – cutting movement speed by 1 – unless your STR is 5+)]. The example for the modern version is the Denel NTW-20. It clocks between 30 and 35Kg, is roughly 6’ long, and much like the Solothurn can be disassembled in two blocks (about 15Kg each) plus ammo so it can be carried. Like 20mm rifles this goes a bit past the original scope of the article. But there is a G.I. Joe character who absurdly totes around such a weapon, and the damage number for a heavy machinegun is an important benchmark. Heavy machineguns (HMG) are almost always mounted on vehicles. The smallest practical one would be a WWII-style Jeep. It works particularly well on a light military vehicle (Humvee or lighter) or in the bed of a pickup truck. A heavy machinegun usually fires a 12.7mm (.50) or 14.5mm round, often with a specialised warhead (Armour-Piercing Incendiary being a common choice – this is what is assumed in the stats). Between the extremely powerful round and the rate of fire, a heavy machinegun can destroy even lightly-armoured vehicles (including many armoured personnel carriers) and wreck stoutly-built houses. HMGs can be deployed by infantry in some circumstances. The limitations are obvious – a common model of tripod that can be used to mount and use a heavy machinegun weighs 20 kilograms, and there’s the matter of carrying the weapon and its ammunition. The stats below do include a benchmark for superhumanly strong users. The numbers assume the existence of a specialised advantage boosting strength to use heavy weapons. In DCH that’s the Mighty Thews Schtick, in DCA it would be Lifting Strength that is further Limited to lugging around and shooting heavy weapons. 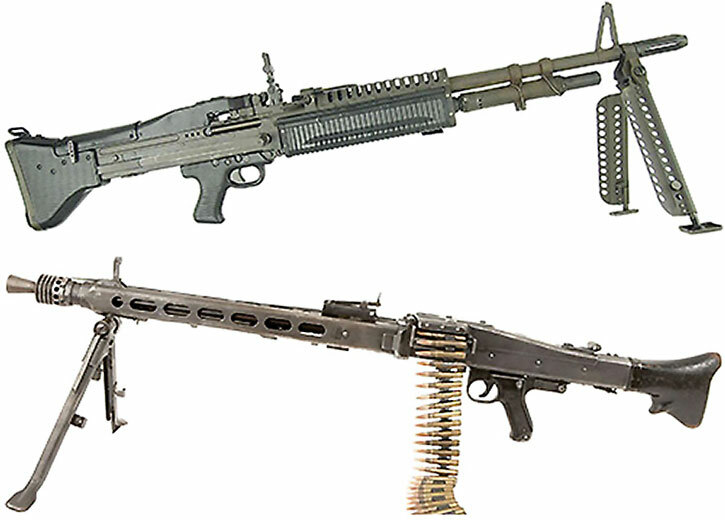 In many stories, all machineguns are considered the same and instead have the stats of a light machinegun. Bulletproof people will withstand HMG fire. Quickly comparing the size of a 7.62mm round and a 12.7mm one will make it obvious that there are significant differences, though. M&M HMG [Ranged Multiattack Ballistic Damage 8, Takedown 1, Quirk (Strength of 5 or more needed to use it like a rifle), Quirk 2 (heavy and cumbersome – cutting movement speed by 1 – unless your STR is 7+)]. In the West, the undisputed queen of the category is a design that has been essentially unchanged since the end of World War One (!) – the Browning .50 Machine Gun. The most common variant is the 12.7mm Browning M2, aka the Ma Deuce. A M2 weighs about 40 kilograms (more than 50 with a 100-rounds belt of ammunition attached – those are huge bullets) and can shoot up pretty much everything than needs shootin’ up short of a main battle tank or Apache-type helicopter gunship. Helper(s): Roy Cowan, Chris Cottingham, Eric Langendorff, Azraelfl, Max, Darci, Pawsplay and (allegedly) Angelina Jolie.